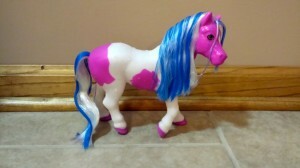 Disclosure: The Ella Color Changing Horse from Breyer Horses was provided for me in order to facilitate my review. All opinions are my own and honest. I am disclosing this in accordance to FTC Guidelines. Please see “Disclose” tab for more information. My girls absolutely love being in the water. Between bath time and pool time, I’m surprised they haven’t grown fins this summer. They were so excited to receive Ella the Color Changing Horse to be able to play with in the water. The Breyer Animal Creations brand is Reeves International’s largest line. Underneath the Reeves International umbrella, Breyer manufactures plastic, porcelain, and resin model horses, animals and accessories for play and collecting. Approximately 20 different artisans handle each individual Breyer model from start to finish – a process, which, 62 years later, is still done by human hands, not machines. Even today, no two Breyer model horses are ever exactly alike! Ella understands the importance of staying true to herself, so while she is full of energy and enjoys playing on her soccer team, she loves to pamper herself after a big game. A bath is the perfect way to relax and reveal her true colors! Kids are in for a surprise when they play with Ella’s hair. Put her in water and all her purple markings, mane, and tail turn pink. Ella also includes a terry cloth bathrobe, atomizer spray bottle and brush. We were absolutely in love with this wonderful little horse. My daughters always play with it in the bath and even beg to be able to take it to the pool as well. They have recently really started liking horses, and what better horses than a horse that is both pink and purple, Every little girls’ dream! As soon as you put the horse in the water the purple on the horse changes to pink and her purple hair changes to blue. The girls love to put her in and out of the water and see the way the color changes. They also really enjoy brushing the hair on Ella. When they brush her hair, it is so easy for them to brush and they enjoy taking turns brushing it and playing with Ella. This horse truly is any little girls’ dream. It’s the right size to be able to play with and is changes color which is always exciting to little girls. 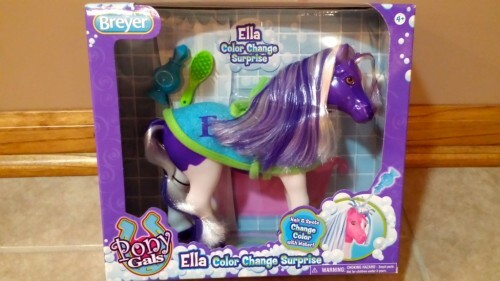 If you are interested in purchasing Ella Color Change Surprise, head on over to Breyer Horses and get one for the little girl in your life. 1 Lucky winner will receive an Ella Color Change Surprise. This giveaway is open to U.S. residents only. The giveaway ends 8/4. I like the classics. Hongvi and Hinto Thanks for a great giveaway! I think the Chloe Care for Me Vet Set would be a cool gift. My daughter would love this! The rescue set is really cool too! I like the Classics Animal Rescue Set. Visited the site and I really like Prancer Carousel Horse Ornament Melody for the tree, very adorable and great as a Christmas gift. I like the stablemates red staBLE set with 2 horses. This looks fun. I really like the Trotter soft beanie horse. Thanks for the giveaway! I am excited. I hope I win the prize. My daughter would love the Wind Dancers 4-Piece Gift Set. She loves horses so this would be wonderful. My girls LOVE Breyer horses. My girls would love the Wild Blue Book and Model Set. Thank you for the wonderful giveaway! oh boy I remember playing with my mother’s Breyer horses when I was younger. I would play in my room letting my barbies ride them for hours! My daughter would love the Jasmine Color Surprise. I would love to win this for my little niece! would love to win this for my Daughter she would LOVE it! This looks really cute. I most like the Ella Color Change Surprise Horse 🙂 I am very excited. I hope I win. Thanks for the giveaway! My daughter would best love the color changing horses, but also the stable set with the two horses! I like Sumatra! Thanks for the giveaway! I am excited. I hope I win the prize. The magical part of me finds the Wind Dancer Horses most appealling. They are so pretty. I love the website, with the craft section. i love playing with breyer horses when i was growing up! 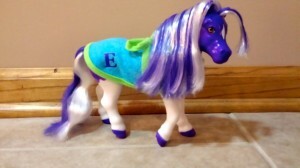 this is such a cool pony – i know a little girl who would LOVE this! I am most interested in the Classics Animal Rescue Set. I like the Gypsy Vanner. Thanks for the giveaway! I am excited. I hope I win the prize. My daughters love horses. I’ll bet they would love the Amelia, Appendix Quarter Horse.